Former professional football player Robert Turner graduated from college and had other options after his career in football. He explores the difficult transition for many players who leave the field and pursue a regular life. This weekend football fans will watch the Los Angeles Rams take on the New England Patriots in the 2019 Super Bowl. While many are wondering when Patriots quarterback Tom Brady will retire, one thing is certain: he will have plenty of options and protection. The same cannot be said for many players who leave the NFL. Former player Robert W. Turner II discovered this firsthand after the end of his football career. He played for the defunct United States Football League, the Canadian Football League and the NFL. 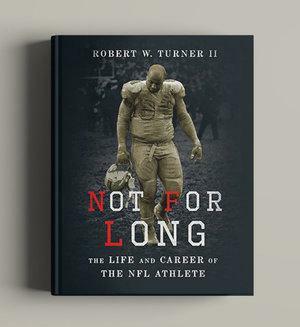 In his book, “Not For Long: The Life and Career of the NFL Athlete” (Oxford University Press/2018), Turner reveals that the fame and fortune associated with being a professional athlete is more myth than anything else. Behind the multimillion dollar players like Tom Brady, there is a cast of men who earn the league minimum, which is currently $495,000 per year. While high-profile players are usually protected by the league even after retirement, others find themselves in financial crisis without skills to find employment and injured without health insurance. Turner joins host Frank Stasio to talk about the the Super Bowl and share stories from the many players profiled in his book. Turner is a professor of clinical research and leadership at George Washington University. Turner will be at Quail Ridge Books in Raleigh Thursday, Jan. 31 in conversation with Ron W. Rice Jr., the Chairman of the Board of the National Football League Alumni Association. Football has remained one of America’s favorite forms of entertainment for years. Even as its ratings fall, the National Football League is estimated to have made $14 billion in 2017 alone. But science is finally catching up to the sport, and it suggests the big hits that delight fans do not come without a price. When he first started playing football, Jason Brown saw it as a business decision. He wanted to get a scholarship to college so that he would not be a financial burden for his parents.